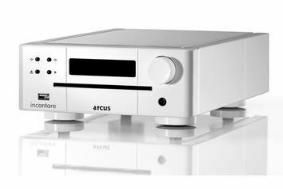 High-end German AV company Arcus to launch in the UK | What Hi-Fi? Today the company has expanded its remit from hi-fi to include audio servers, Internet radio, hard disk machines and CD-ripping. The DAR300 audio server was the first product that flirted with the future, offering Internet radio, an in-built hard disk and Ethernet network connectivity. But it's the new Arcus Incantare Music Station that will be setting the ball rolling in the UK. Designed to be a simple product for audiophiles, it has a CD player, ripper and hard disk, plus an integrated stereo amp. The all-in-one system should see the light of day in the UK in the next couple of months and will retail at around £1295.